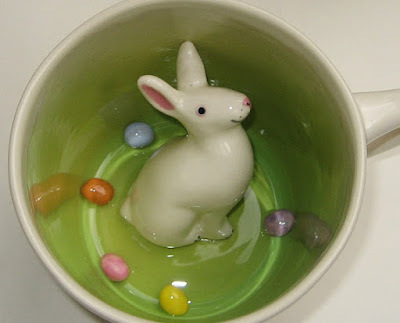 I have never done a post on Easter coffee mugs and I realize I am doing this one a bit late for Easter of 2016. However, these handmade pottery mugs by Sarah Spademan are just too darn cute NOT to write about...they might make it to you on time if you were to order now and besides that, there is always next year. They're white on the exterior with a colored interior and a hidden peek a boo animal on the inside. Spademan calls them Animugs. I call them cute. Each mug holds 12 ounces of your favorite steamy hot beverage and Spademan says they are dishwasher and microwave safe though I would be inclined to NOT put them in the dishwasher. They are so lovely that I would be scared that doing so would shorten their life. She also says they are lead free. Something else to be pleased about. If they are just too darn cute for you, hop on over (Easter time pun intended) and check them out on Etsy by clicking right here. 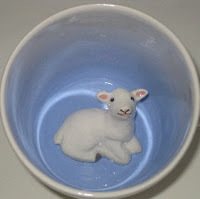 You will be glad to know that Spademan does a large variety of critter themed cups that are suitable for use all year long so you can have one without making it Easter specific if that is your preference. So how about it? 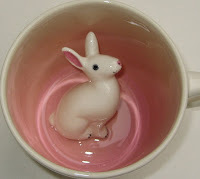 Do you use an Easter-themed mug? Will there be a Sarah Spademan coffee mug in your collection? Watch for another Animug post here soon. 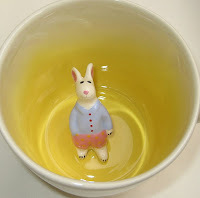 Check out all of Sarah Spademan's mugs here. Check out my Easter listings on eBay.